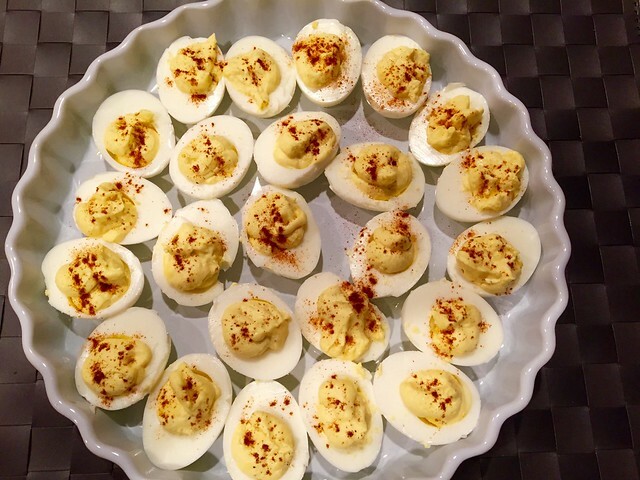 Deviled Eggs were the highlight of any family potluck when I was a kid. 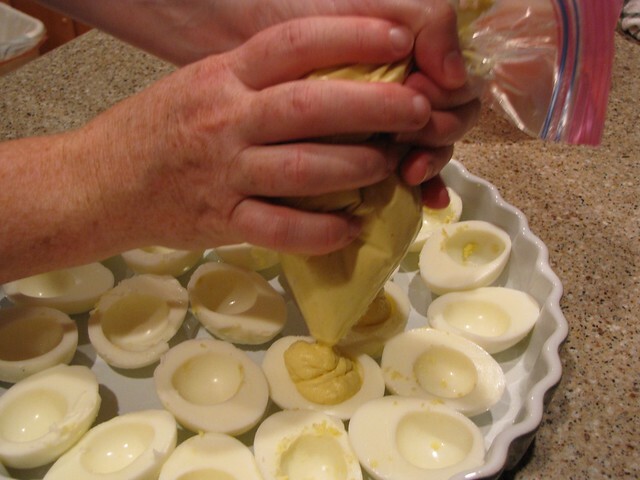 My cousin Ray used to clean my plate for me so I could go back for seconds of Deviled Eggs. 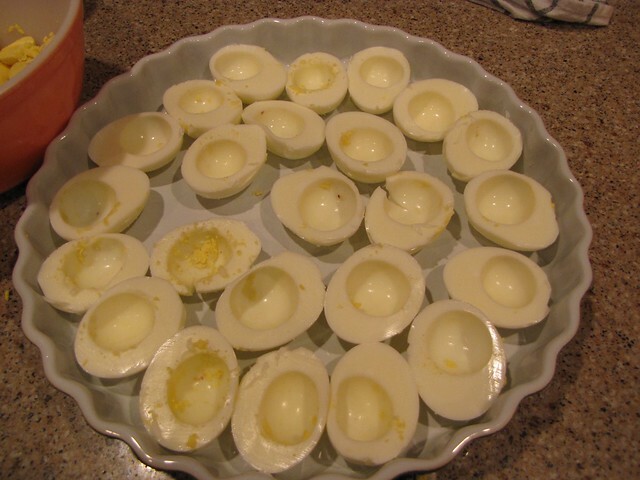 Sadly now my stomach hates me when I eat eggs so it is a true testiment of my love for Jim that I made him a whole platter of deviled eggs to take to a work party and I didn’t snitch even one. These are so good. Classic. Just like Grandma used to make. 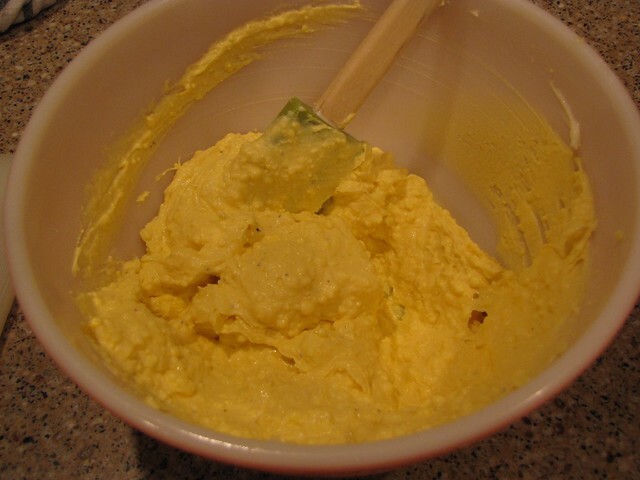 Eggs, Mayonnaise, Yellow Mustard, White Vinegar, Paprika, Salt & Pepper. Hey look, there’s half of a plate of Buffalo Chicken Dip sitting up there. If you haven’t tried that one, you’re missing out. I’m guessing the same folks who like Deviled Eggs would like a nice cheesy plate of Buffalo Chicken Dip too. Place 12 eggs in a large pot and fill with cool water so that the water covers the eggs by about 2 inches. 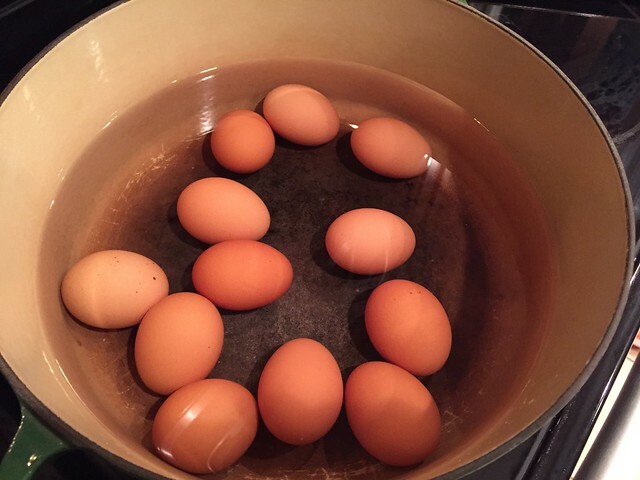 Be sure to use a pot big enough so that the eggs are in one layer and are not crowded. We don’t want them to bang together and crack. Bring the pot to a rolling boil over high heat. When the water is boiling, cook the eggs for 1 minute. After 1 minute, turn the heat OFF and cover the pot with a lid. Let the eggs sit in the hot water to cook for 12 minutes. 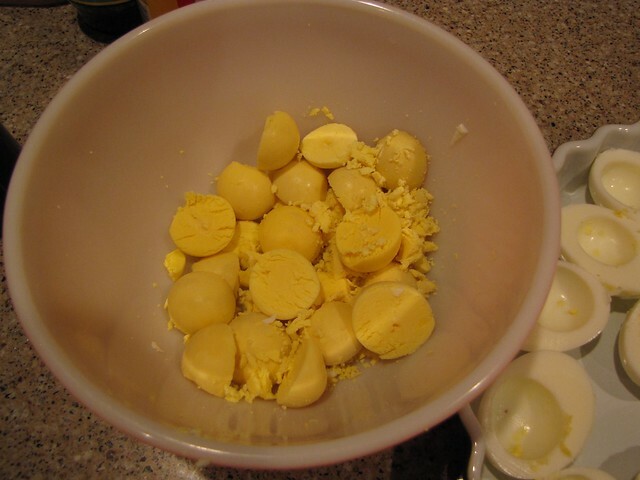 After 12 minutes, drain the water off the eggs and run cold water over them for 2-3 minutes. This stops the cooking process and helps cool the eggs for easier peeling. Here in Florida, it’s odd but we don’t have super cold tap water, so I usually run my eggs under water as cold as I can get for a couple of minutes then fill the pan up with water and pop a couple of ice cubes in there too. Once your eggs have totally cooled, crack the shell all over starting at the bottom or widest end where the little air pocket is. For easiest peeling, peel the eggs under gently running water. Cut each egg in half lengthwise, scoop out the yolk into a medium bowl, and place the white halves on a platter or egg plate. Didn’t I used to own an egg plate? Wonder where I left that? Oh well, the quiche pan works in a pinch. 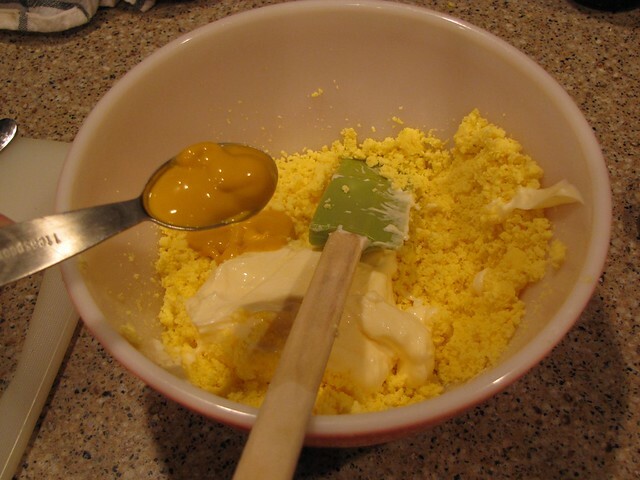 Use a fork to mash up the yolks into tiny bits. 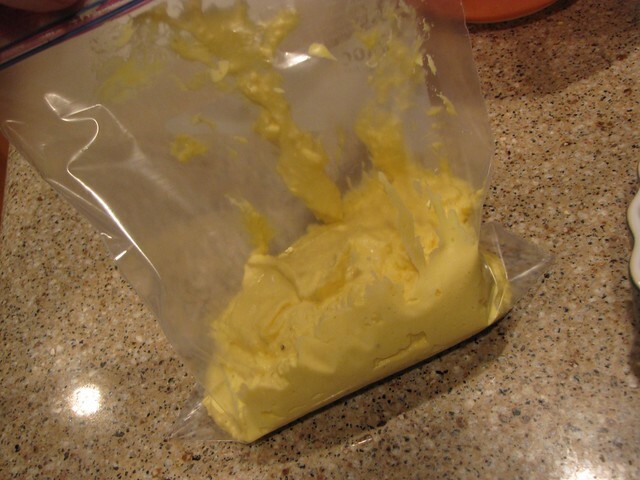 Then add ½ cup mayonnaise, 2 teaspoons white vinegar (I only had white wine vinegar but Grandma always used plain old white vinegar), and 2 teaspoons mustard. If these weren’t for Jim, I might have tried to sneak Dijon mustard in there but yellow mustard is the classic way. Add a pinch of salt & pepper then mix the yolks together until very, very smooth. Now, you can try to spoon this back into the egg white halves but that gets pretty messy. An easier way is to use a quart size zipper bag with the corner cut off to make a piping bag. 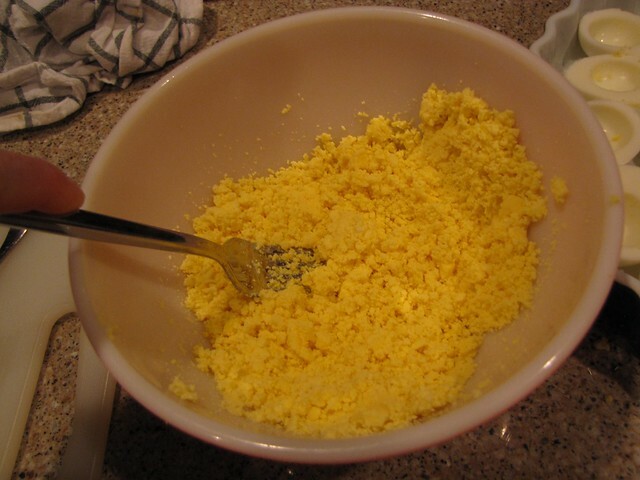 Squish the egg yolk mixture down to the cut off corner and twist the top of the bag to make it funnel down as you go. Then fill up the eggs one at a time. Anyone need a super pink freckly hand model? I didn’t think so. Finally top each egg with a pinch of paprika. I might be tempted to add just a little parsley or a chive on top but honestly, these eggs don’t really need any fancy-ing up in my book. 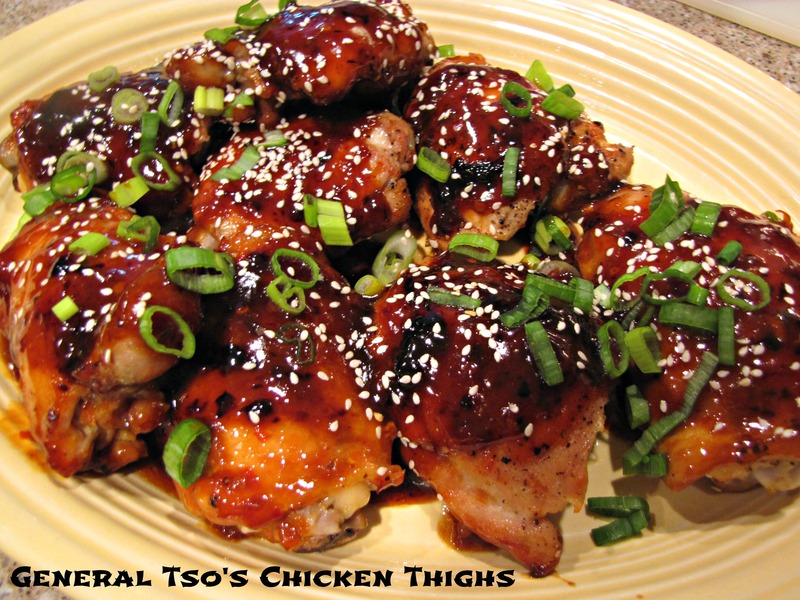 Give these a good hour or more to chill out in the fridge so they set up and get nice and cold. It isn’t a potluck without them! Or not…still a few problems with the website. 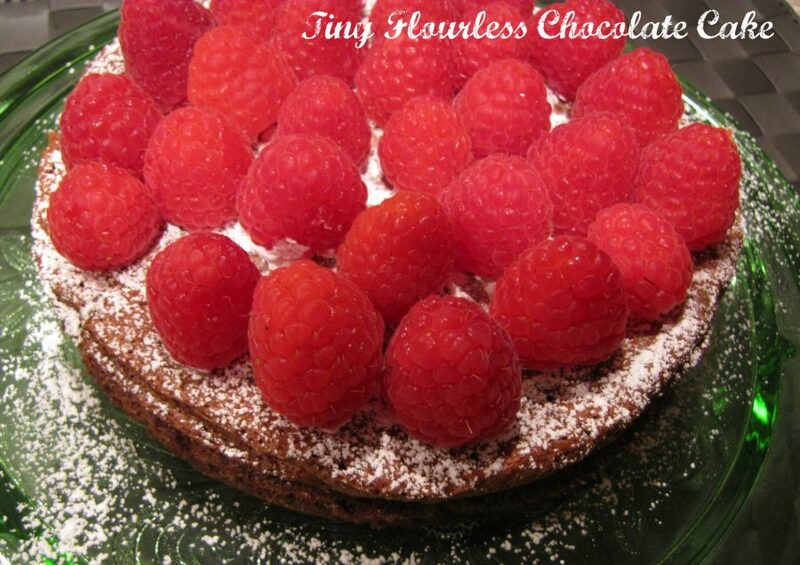 This is a fairly easy one to copy down but I’ll also try to post the printable on the Idiot’s Kitchen Facebook Page. 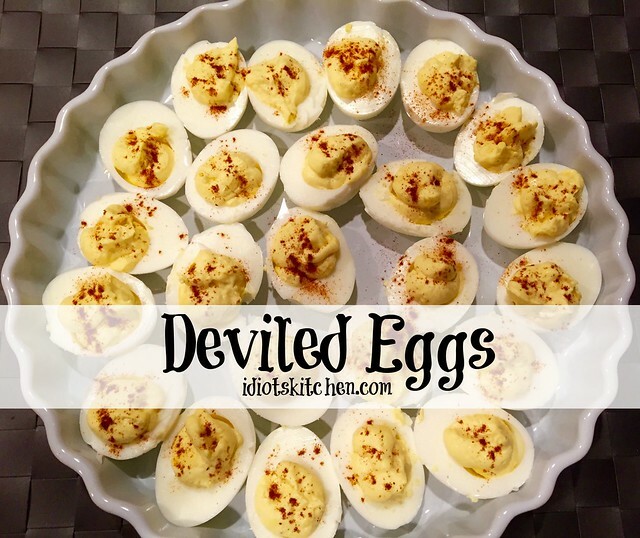 I just looooooooooooove Deviled Eggs. 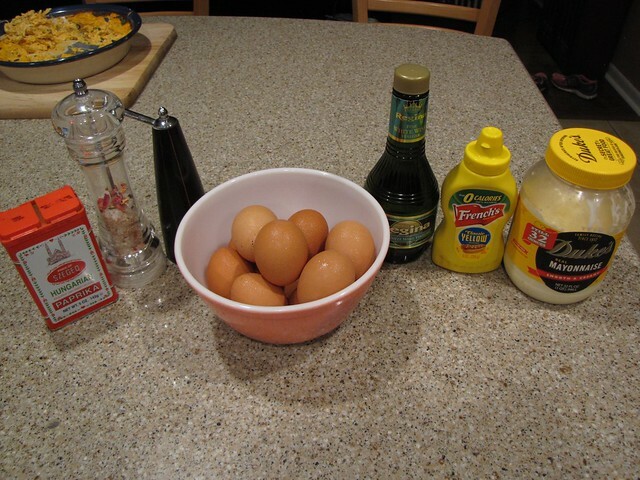 Make mine exactly like you do, except I use Dijon Mustard (which Pete does not like, but I do). I also add a little curry powder. Gives a different taste. I do have a deviled egg glass plate!!! Hi Claudia, I used to hard boil eggs as you outlined above, but I could never get them to peel without great effort and uneven results. I recently tried instructions I found on the ‘net, and the eggs were by far the easiest to peel I have ever prepared. 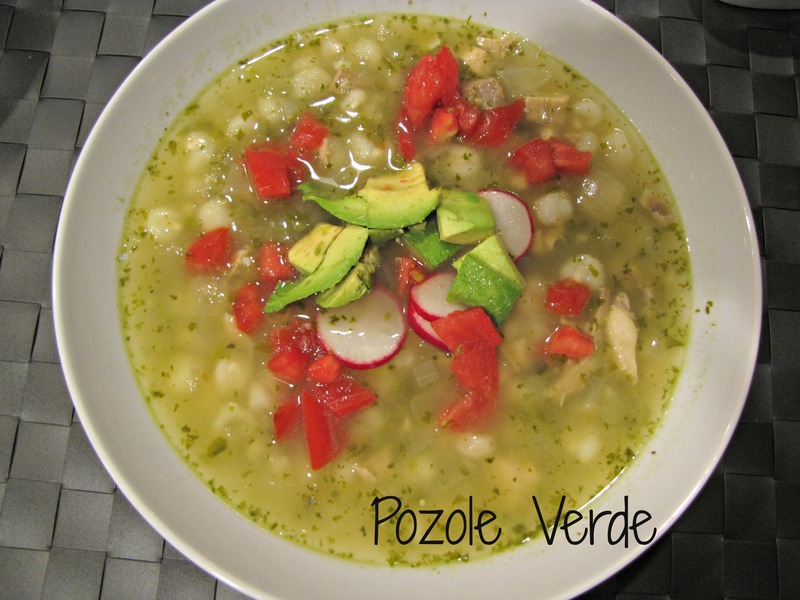 To 4 cups of water add 1 tablespoon of vinegar and bring to a boil. 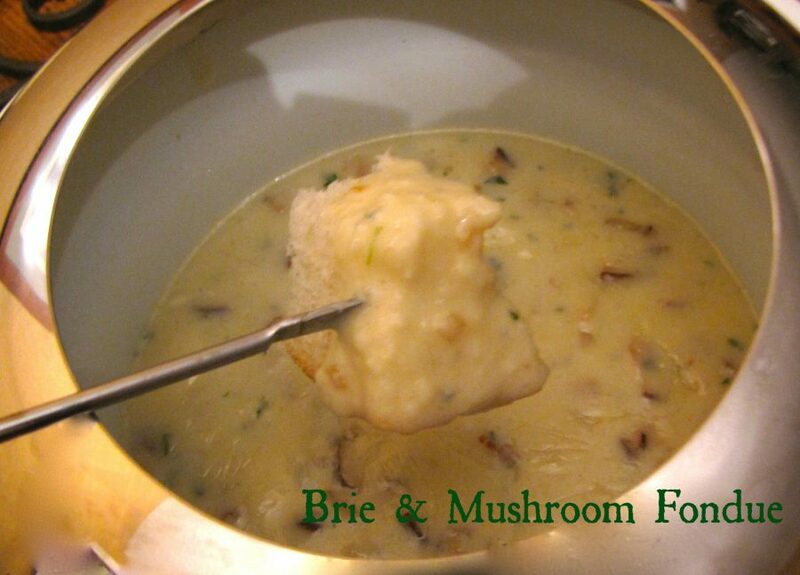 Lower the eggs gently into the water with a spoon and cook at a low boil/simmer for 14 minutes. Drain and submerge the eggs in cold water and ice. Peel them as soon as they are cool. (The Crazy Russian Hacker dude says smash them on the counter and roll them back and forth.) The eggs will peel flawlessly in seconds. I think the key elements are the vinegar, starting with boiling water instead of cold, and peeling them after they are cooked and cooled. I’ll definitely try this technique and certainly seek out the crazy russian hacker dude. Now I’m curious!